This noodle dish isn’t complete without a saucer of pickled green chillies so if you have time, do try and make the green chillies the day before. Place your sliced green chillies in a boil and cover with boiling water. Allow the chillies to steep in the boiling water for between 12-15 minutes. 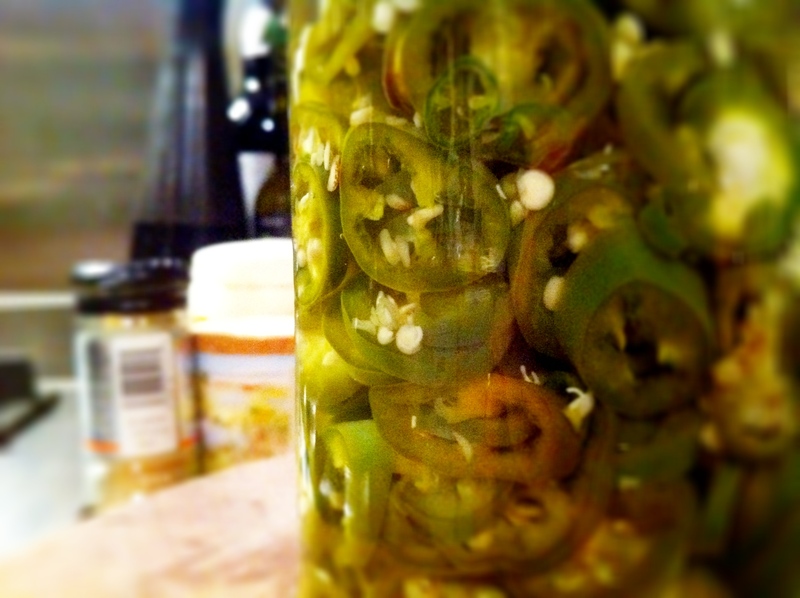 Drain the chillies well and put them into a jar. Cover the chillies with the vinegar and add the salt and sugar. Stir until the sugar and salt has dissolved and leave overnight. 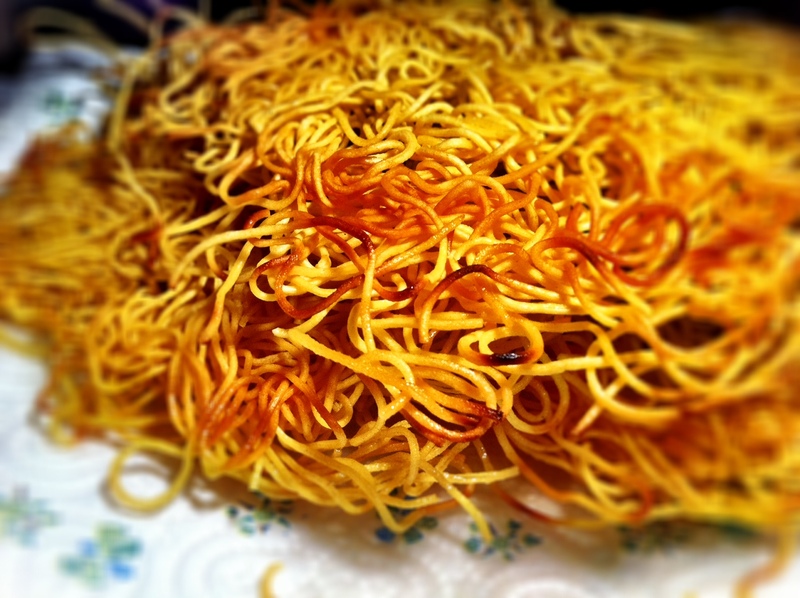 Crispy fried egg noodles. Yum. Roughly portion the noodles out into 4 rough portions. 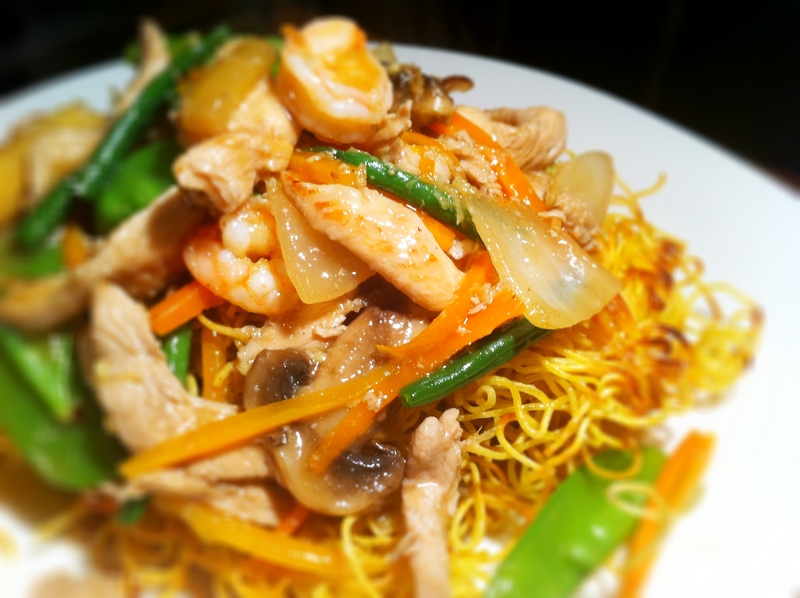 In big wok, heat 1 cup of vegetable until super hot and gently drop 1 portion of noodles into the hot oil. Using a spatula, try and fan the noodles out. Fry until crisp, flipping the noodles over to make sure they fry on both sides. It can take anywhere between 5-10 minutes to get each batch crispy. Remove the noodles from the oil and let them drain on paper towels to catch any excess oil. Repeat until you’ve crisped all the noodles. Set aside the noodles. On high heat, stir fry your onions for a minute or so and then add the minced garlic and ginger. Fry for another 30 seconds and then add the chicken. Give the chicken a good mix so the onions, ginger and garlic are mixed through. Put a lid on the wok and allow the chicken to cook for about 1 minute. Stir it again and put the lid back for another minute. Add all of your vegetables, give the stir fry a good toss and then pour your stock in. 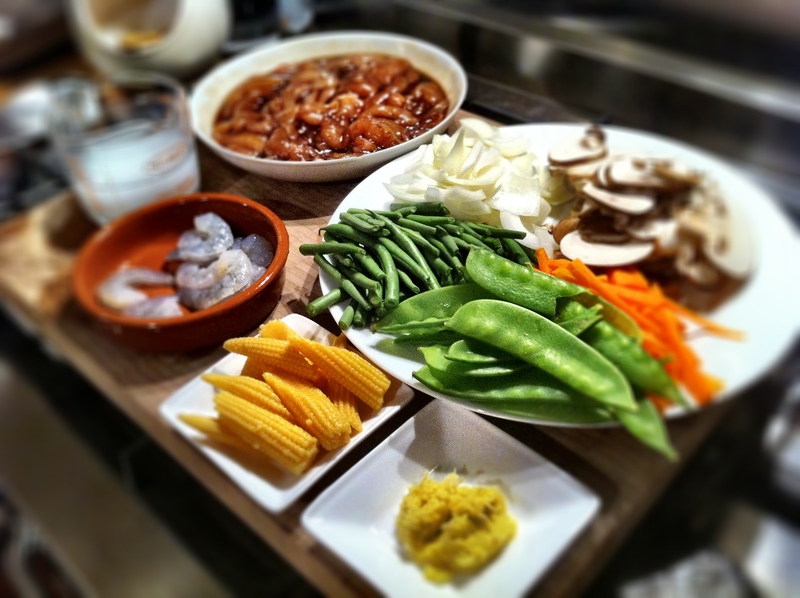 Mix well, cover the lid again and let the vegetables and chicken stew for about 2 – 3 minutes. 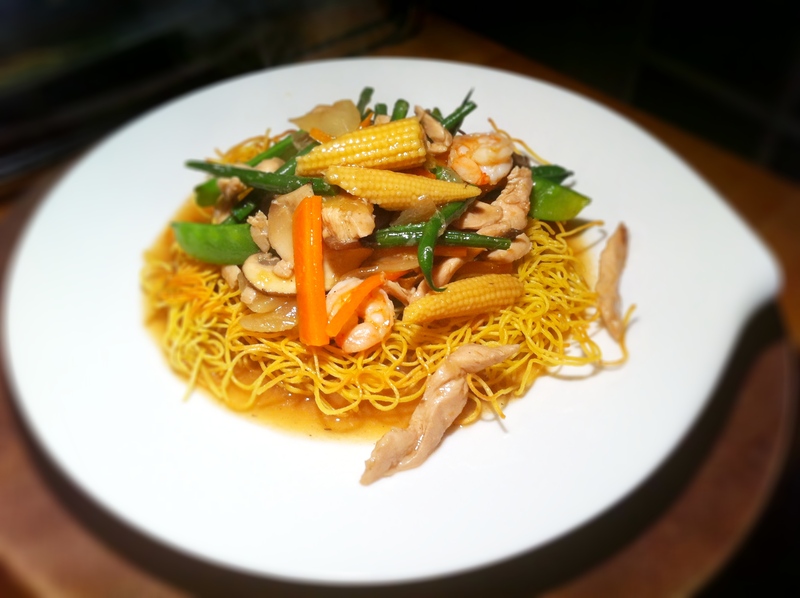 Finally, give your cornflour mixture a stir and pour it over your stir fry. You’ll see your sauce thicken and turn glossy. You only need to cook this for another minute or so and then you’re ready to serve. Crispy mah mee. Absolutely scrummy. 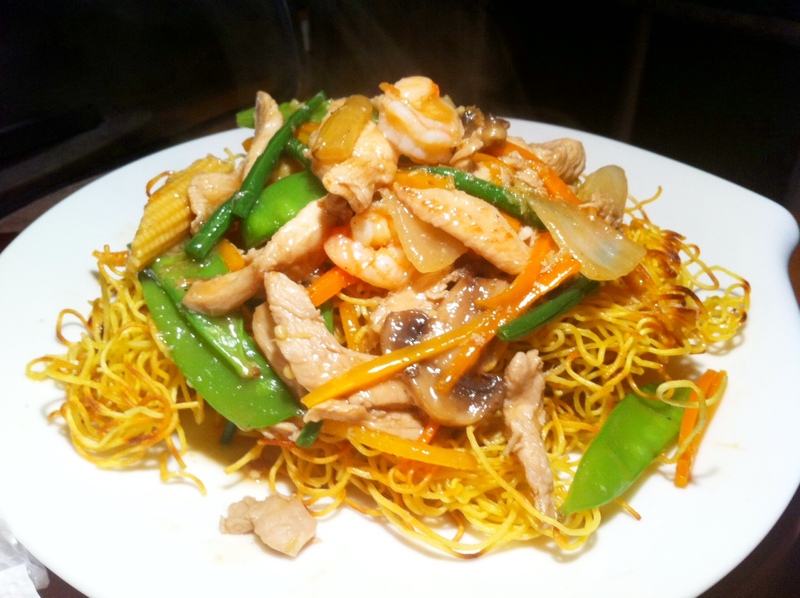 Place 1-2 pieces of your fried noodle on a flat plate and spoon your stir fry mixture over the top, making sure you put a good ladle of the sauce all over. 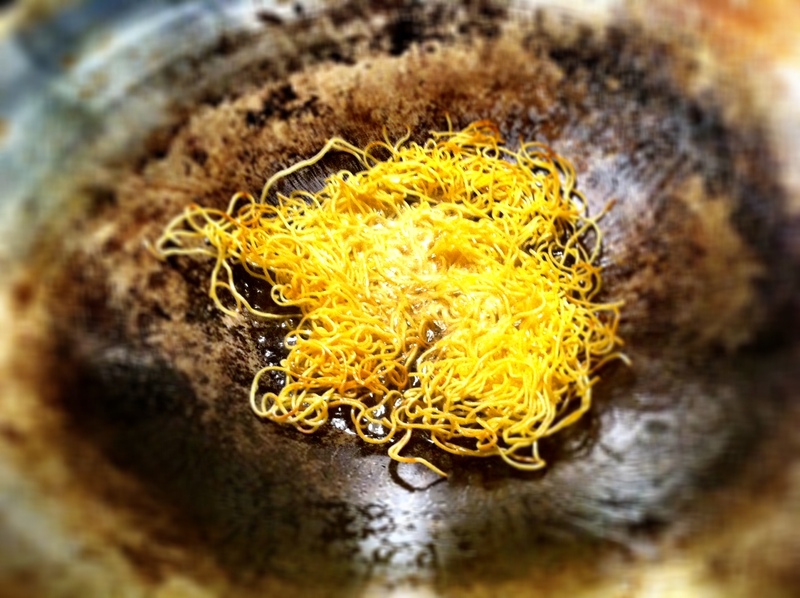 Serve your crispy mah mee with a small dish of pickled green chillies covered in 1 tablespoon of soy sauce.